Guess who’s back! 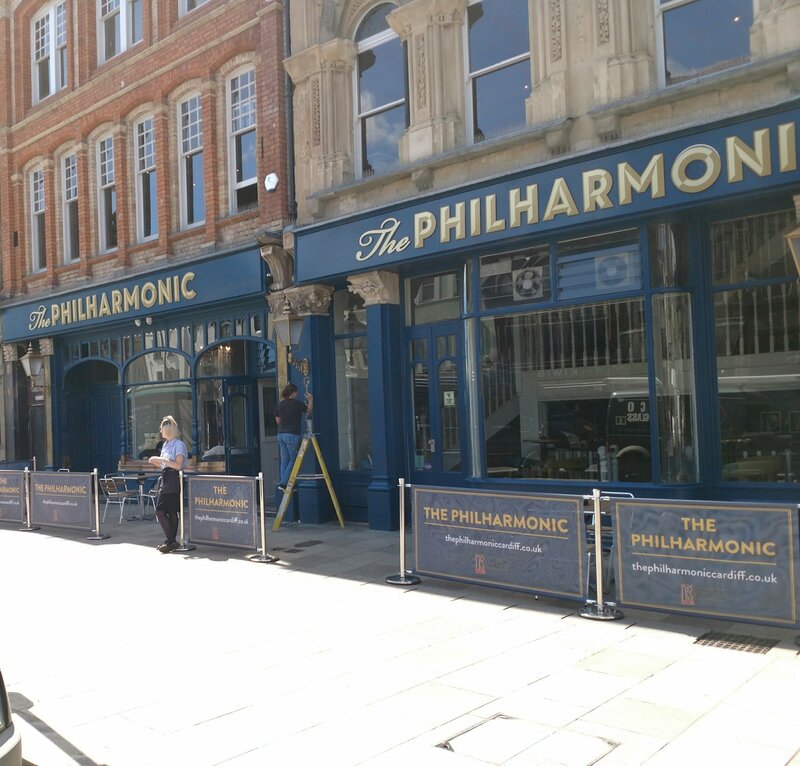 The return of the Philharmonic, Cardiff City centre. I have lived in Cardiff for more years than I care to remember and for a big chunk of those years the Philharmonic (aka the Philly) was pretty much a constant presence in terms of a night out. Back in the late 80s and early 90s when most pubs closed at 11pm it was one of only a few places where you could drink yourself silly into the early hours. In those days I was a regular visitor, not for food (only food I was aware they did back then was bags of crisps) but to get bladdered and with the hope of getting lucky (former happened all to often, the latter almost never). As the years went by and things like having a proper job, a long term relationship and then marriage impinged increasingly on my ability and indeed desire to have a skinful so my visits decreased and then stopped. It seems my generation kept it going as, when we stopped visiting, the baton was not really taken up by the next one. 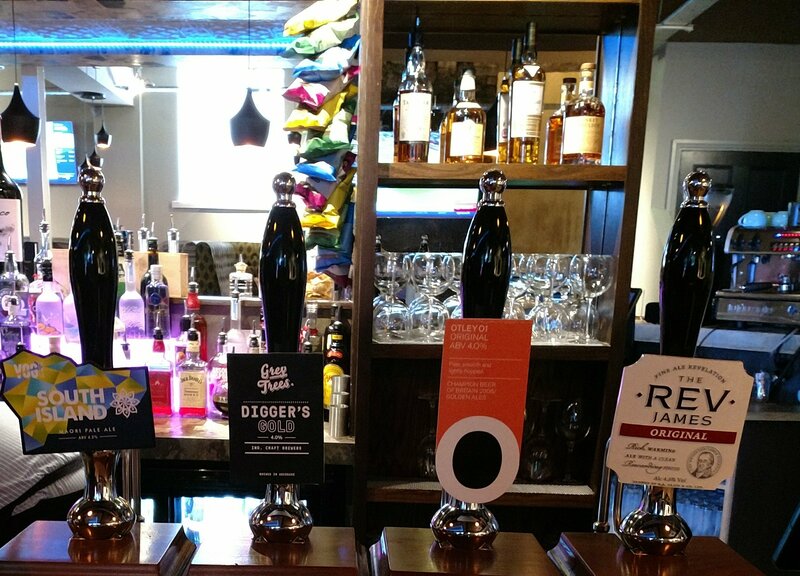 Too much choice with the relaxation of licencing laws (younguns won’t know of the routine, back in the day, of ordering 3+ pints at 5 to 11 and chugging then back before kicking out time) and so began a long, slow, decline to eventual closure. 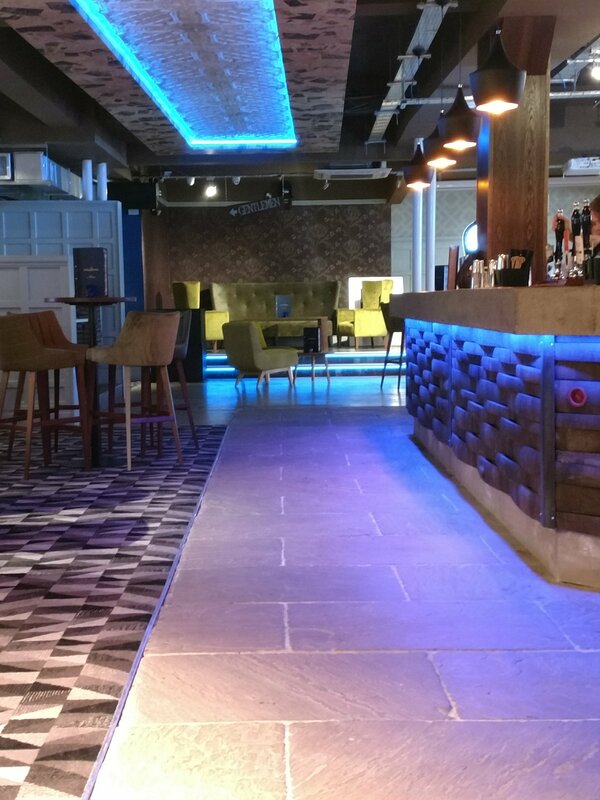 It has now been revamped and reopened and it is not the thought of reliving late night boozing (and shenanigans) at an old haunt that piqued my interest, but the food on offer of a lunch time. How our priorities (and capabilities) change with age!! My previous recollection of the place are, it is fair to say, hazy so it is tricky to compare. I recall a somewhat spit and sawdust joint, with very sticky floors. In the twilight years of my visits it certainly needed some money spent on it. This has, belatedly been done with a major refit. Outside it looks pretty much the same, bar from a lick of paint (still finishing off at time of visit), but inside much has changed for the better. Perhaps my memory is failing me, but it now seems a lot smaller especially downstairs. J (who had been their boozing on a previous night) said there is, upstairs, a nice terrace area. Didn’t get up there so will have to take her word for it. 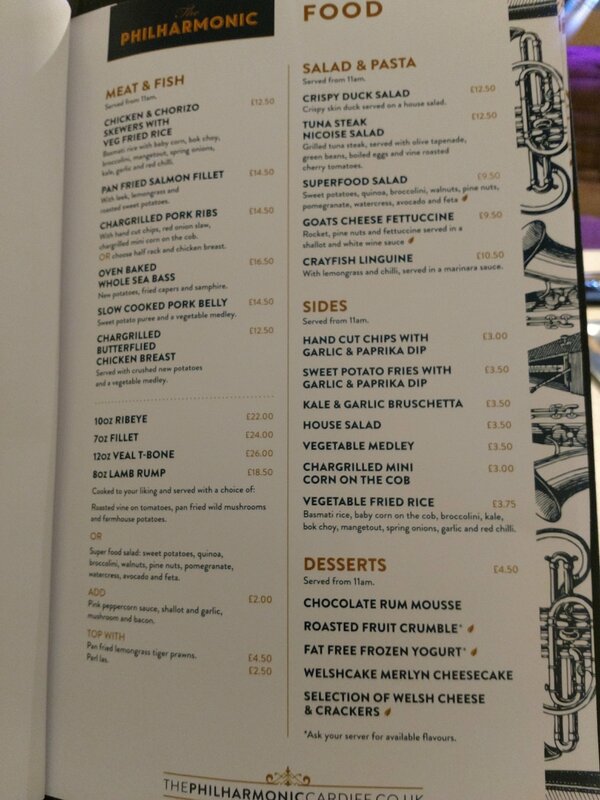 The food offering is surprisingly diverse and they are clearly looking to differentiate themselves from the cheap and cheerful pub grub market with their menu. Pheasant (here irritatingly referred to as “pulled” – please enough of this obsessive use of the term) filled sarnies, a veal T – bone and a whole baked seabass are not items you would find on the menu in most Cardiff city centre pubs and certainly not on the menu in the Spoons (as my nephew calls Weatherspoons, with a emphasis on the “oo”). They are all on the menu here though, which is a bit of a surprise if I am honest. Despite the allure of the interesting sounding (trio of pork for example) small plates (not everything in a small portion is tapas) offering (3 for £14.95 or individually between £4.50 and £6.25), I have had a serious dearth of burgers this year, such that so far one (in the form of the cheese theory from Burger Theory @Kongs in Cardiff back in January) has featured on the blog (thinking about it my visit there may actually have been in December). 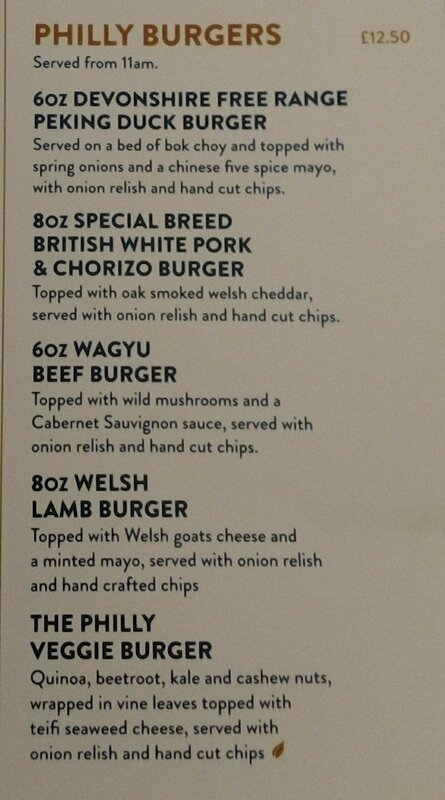 Due to this I looked to the burger element of the menu – with a choice of 5 (including an interesting sounding veggie one – nice to see use of the veggie friendly and Welsh teifi cheese here) – all priced (with chips) at £12.50. Not sure about a Peking duck burger (prefer it in a pancake or, perhaps, a bao) or the waygu one (highly suspicious of the provenance of waygu when it comes in a burger – albeit a smaller sized one – at the same price as pork or lamb ones), but other options looked promising. I narrowed my choices down to the pork and chorizo and the Welsh lamb numbers. 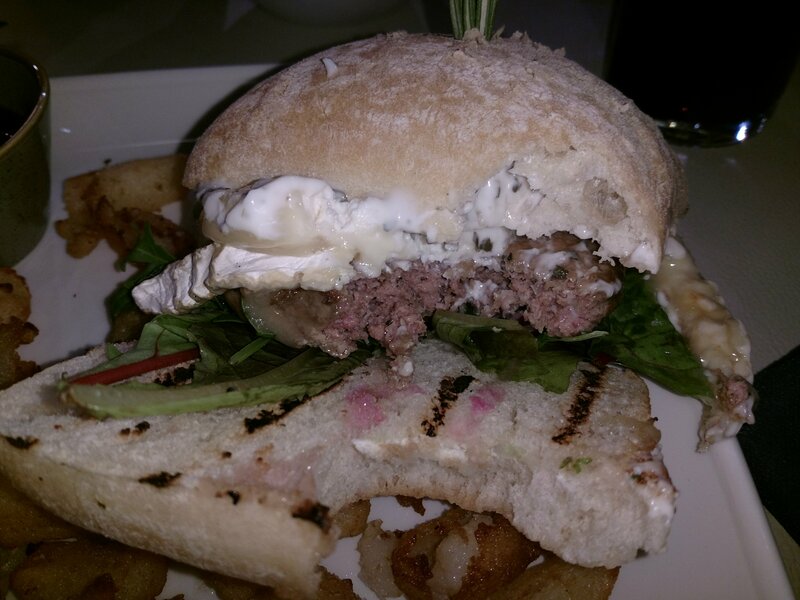 I like both in burger form, but my preference is lamb for two reasons. Firstly you don’t get much better lamb than Welsh lamb and secondly it can be served (unlikely a pork based burger) medium rare (although, due to things I have banged on about pretty much constantly re burgers, it rarely is). The lamb therefore offered the chance to request my burger medium rare and see if the kitchen operated in line with the FSA standards (in terms of the supply chained used to source the meat, amongst other things) required to allow this. With no dire warnings on the menu of zombie apocalypse if the burgers were served other than well done, I assumed medium rare would not be an option, but nothing venture nothing gained so I asked. Predictable the response was “I’ll check, but don’t think the chef does” and nothing more was heard on the matter (i.e no can do – health and safety innit). The bun was ciabatta- not great fan of this as a burger bun and here it was just a touch on the dry side. Having said that it was nice and juicy, with a decent enough flavour to it, and the patty itself was a good size. In terms of the additions, the mayo had a pleasing hit of mint, but the big chunk of goats cheese (nice enough of itself) rather overpowered everything else including the lamb. 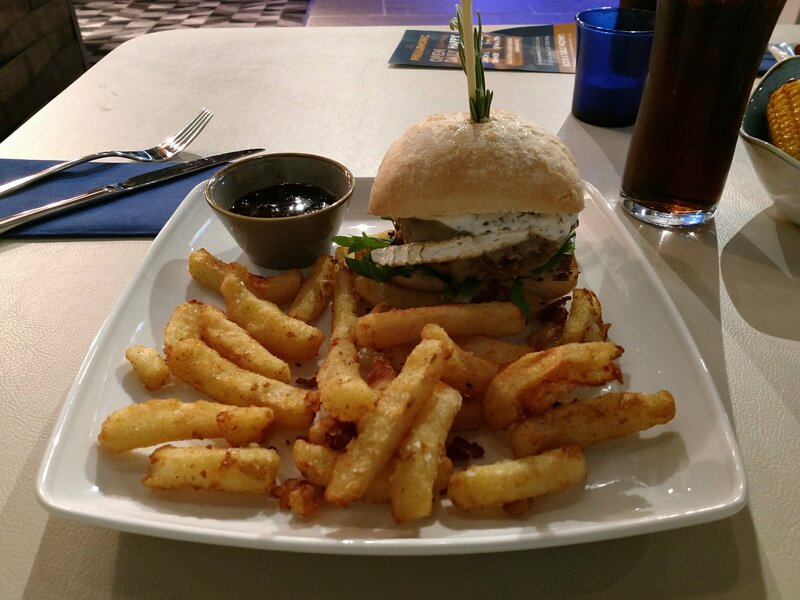 I don’t think a topping should ever be the main event flavour wise in a burger – that is the job of the patty. A case of less is more I think re the cheese. The chips were good (no idea what a handed crafted, as opposed to hand cut, chip is mind), with some rather nice crispy bits on the exterior and a fluffy interior. Decent size portion too. All in all nice enough, but not without flaws and a tad pricey at £12.50 I thought. Certainly not up there with the brilliant Lamb Shank Redemption at Patty & Bun and more expensive to boot. J (back on the diet fad – this time no complex carbs) went for one of their stuffed sweet potatos (spookingly I knew she would), with a filling of turkey mince and black bean chilli (£5.45). Good sized portion again (especially for the £5.45 price tag – seemed to me strange that it was so much cheaper than the burger), with a nicely cooked sweet potato and a generous amount of both the chilli and side salad. 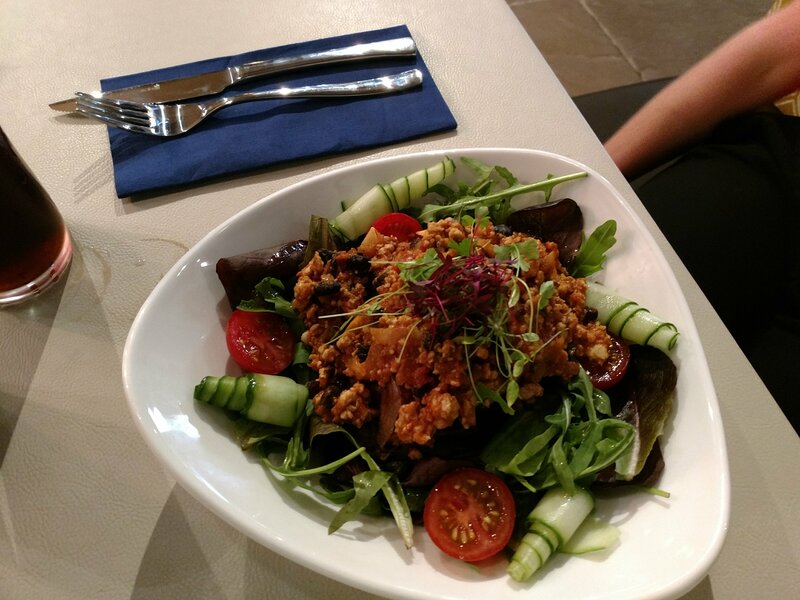 The only downsides were the turkey mince chilli was a bit tame (more like a UK style Bolognese) and, one of my bête noires, no dressing on the salad. Seems odd to me that the kitchen went to the trouble of making pretty cucumber curls, but then didn’t dress the salad. 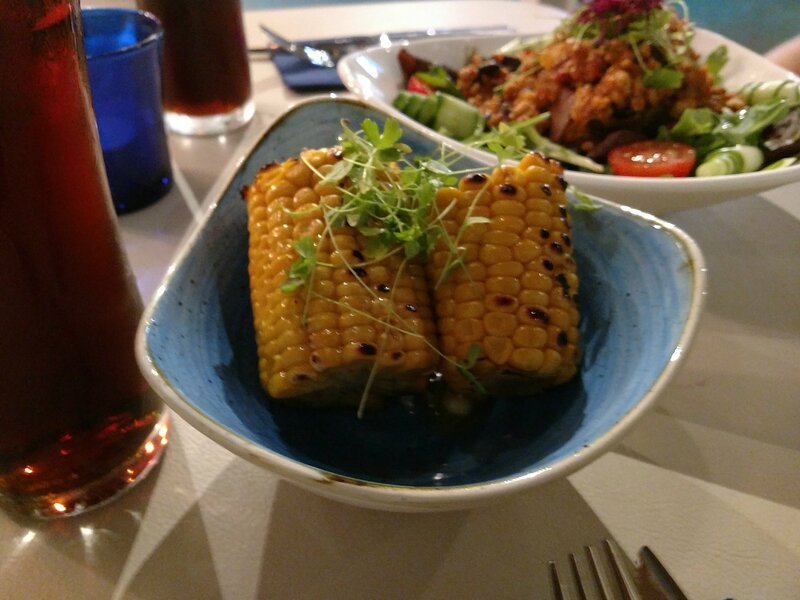 J also ordered a side of corn on the cob (£3) ostensibly for us to share (especially when the size of her sweet potato dish became apparent) but I didn’t get a look in. She seemed to quite like them!! It was a work day lunch and as such a no booze event (J and I had boring sodas – me a fat one, her a diet one – £3 for a pint), but the drinks menu did pique my interest. 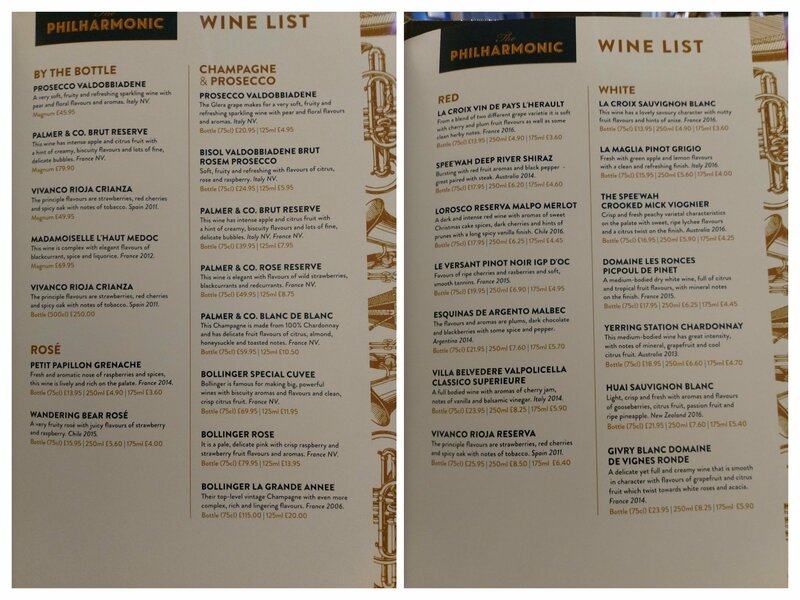 The wine list is short, but has some interesting stuff on it. Vivanco are a good, Briones based, rioja producer who have an amazing wine museum tacked on to their winery. Looking at the list, none of the mark ups are outrageous and with prices starting at under £14 (majority of stuff is under £20 and is not rubbish) it seems to me pretty fair value (if a little unadventurous). I would pay good money to see someone (at say 10pm on a Six Nations’ day) try and pour the 5 litre (a rather rare bottle size called a McKenzie) bottle of the Vivanco crianza 2013 (£250) on the list. It must weigh in at 10kg+. I didn’t see the range of bottled and canned beers on offer, but there were some OK draft ones from local brewers. The booze offering was much better than I was expecting, have to say. I would certainly be tempted back for a proper drink. 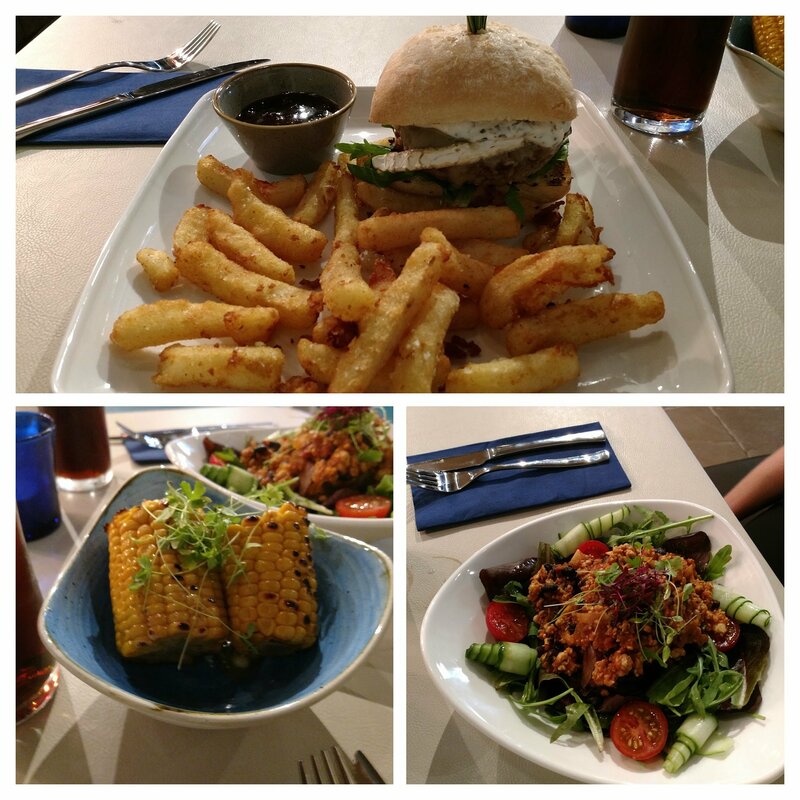 The food was decent enough, if unspectacular, but my burger was not particularly cheap and I think they risk falling between the stools in terms of some of the pricing. 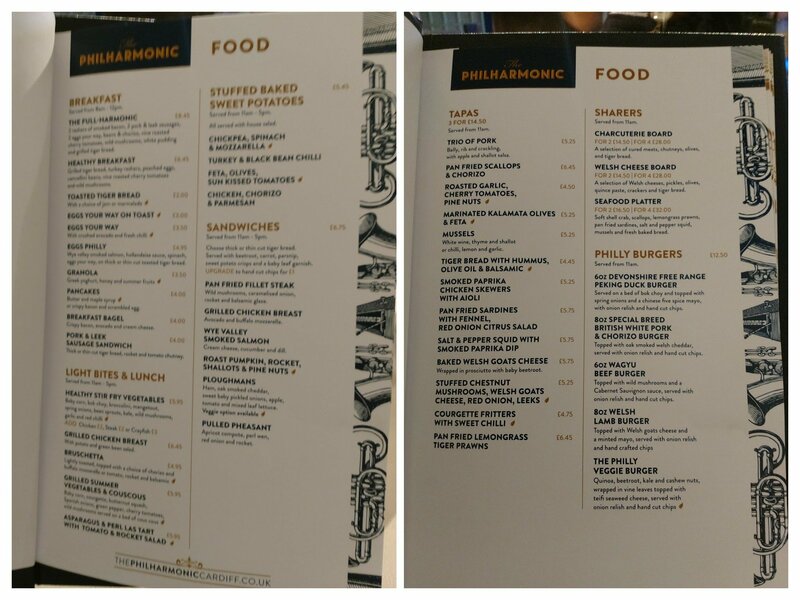 At lunch time, the market is fiercely competitive in Cardiff and if I was looking at spending £10 plus I would probably choose Bar 44 (3 tapas – £11), Asador 44 (£10 – one main course), the Classroom ( 2 courses – £10.50) or the Potted Pig (2 courses for £12, which includes currently a main of a Welsh lamb burger and fries) over the Philly. All these deals, available in the City centre, makes some of the pricing at the Philly look a touch ambitious, I think. What J had offered better value and I wonder if that is the market point they should concentrate on, at least at lunch time. I may be wrong, but I do wonder how many veal T- bone steaks (at £26) they will sell. 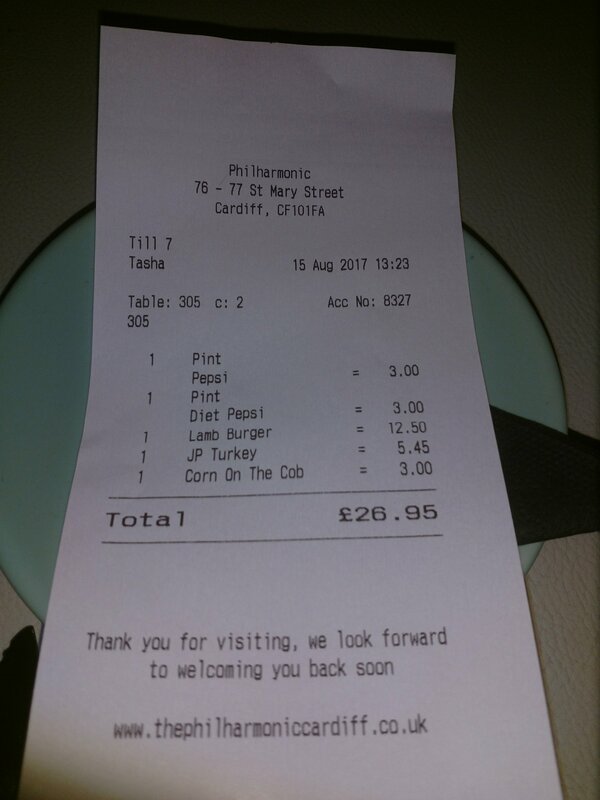 We paid £26.95 for our food and soft drinks – nice enough, but far from a cheap lunch. Would I go back? Yes – but probably more to take a further gander at the booze (relive the old days – not) than for the food. I might be tempted to gets some food whilst there (maybe some of the small plate stuff) to soak up the booze (and stop me falling over – my capacity for booze, bar from good wine, having decreased alarmingly over the years), but food wouldn’t be the primary reason for the visit (but maybe that is the idea). Address : 76-77 St. Mary St, Cardiff, CF10 1 FA. I have a distant memory that the philly used to do cheese boards as their eats. Anyone sober enough at the time to remember? 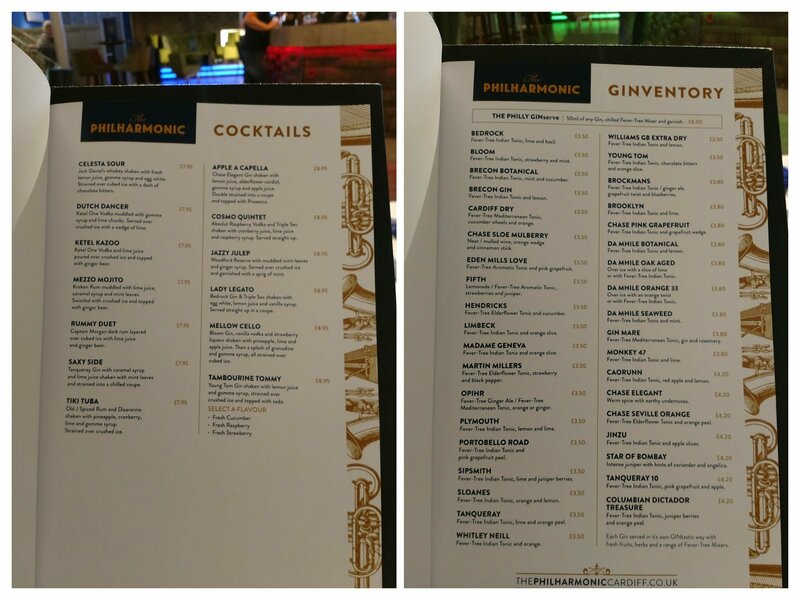 This entry was posted on Aug 20, 2017 by solicitingflavours in Alcoholic drink, Alternatives to sauvignon blanc, Asador 44, Australian wine, Bar 44, Barbecue, BBQ, beef, bitter, breakfast, Brunch, Burger, Burger Theory, burgers, Cardiff, Cardiff restaurant, charcuturie, cheese, cider, coffee, craft beer, desserts, Drink, Dry white wine, fish, Food, Food and wine products, France, French wine, La Rioja Alta, Lunch, lunchtime, Milk & Sugar, New restaurant Cardiff, Non alcoholic drink, Picpoul de pinet, Pork, Pub, pub lunch, real ale, Red Wine, restaurant review, review, Rioja, salad, Sandwich, seafood, Shiraz, South African wine, Spain, Spanish wine, steak, Tempranillo, The Philharmonic, veal, Wales, White wine, Wine, wine mark up, wine pairing.